The HD remaster of a fan-favorite RPG has a collector's edition for both North America and Europe. For many people who have kept up with the JRPG Tales of series, Tales of Symphonia on the Gamecube was their first. 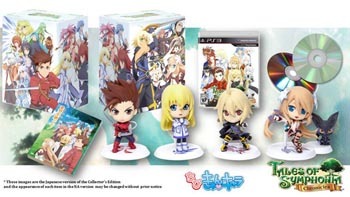 Namco Bandai announced the HD remaster of Tales of Symphonia and sequel Tales of Symphonia: Dawn of the New World, packaged together as Tales of Symphonia Chronicles for the PS3, will launch on Feb. 25 in North America. It launches in Europe and Australasia on Feb. 28. A collector's edition is available in both regions with limited quantities. It includes the game, five small figures, a soundtrack, artwork from the animation studio, and a novel that takes place between the events of the first and second game. The collector's edition costs $100. Tales of Symphonia follows the journey of protagonist Lloyd Irving, the typical JRPG hero in that he is an idealistic teenager set on protecting his friends. He joins his friend Colette on her journey of world regeneration, in which she has to put her life on the line to save their world. Things are not as they seem, and Lloyd has to find a way to save everyone without sacrificing who or what is important to him. Tales of Symphonia: Dawn of the New World takes place two years after the end of Symphonia and follows the new protagonists, Emil and Marta. Emil is chasing after Lloyd, who allegedly killed his parents in a massacre. Tales of Symphonia has remained one of the fan-favorites in the series since its release 10 years ago. If you missed it when it came out, giving it a chance on the PS3 could be worth your time and money.